ABC cuts New Hampshire Union Leader, Trump enemy, from debate. 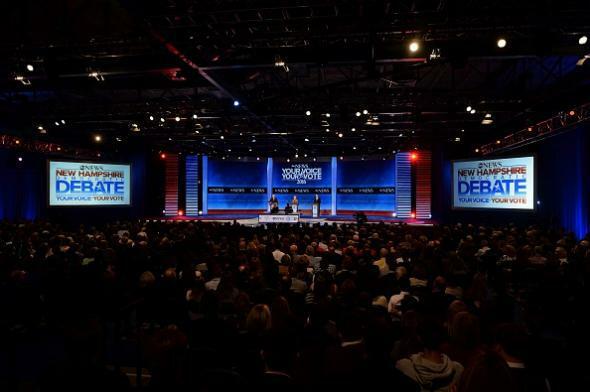 ABC’s Democratic presidential debate in Manchester, New Hampshire, on Dec. 19, 2015. ABC is cutting off their partnership with the New Hampshire Union Leader for the Republican primary debate on Feb. 6, an ABC spokesperson has confirmed. The paper was set to have a co-branding relationship for the debate, though it was going to be a comparatively minor role, without any representative on stage asking questions on behalf of the newspaper. Trump has threatened to boycott two previous debates—CNBC’s over the format of the event and CNN’s because the network doesn’t “treat [him] properly”—but ended up participating in both. (CNBC agreed to Trump’s terms.) He is leading New Hampshire polls by approximately 18 points.